First thing, did your order contain prescription items? If so, have you supplied a valid prescription? We are unable to process orders until we’ve received and checked a valid prescription. We will have emailed (and if we’ve got your phone number) sent a text about this. Please get in touch and we’ll update you. If your order contained only non-prescription items then it should have been dispatched promptly. Check with neighbours and the postman’s standard ‘safe places’ to see if it is there. If the order was being delivered by courier then check your phone as they should have sent a text with delivery details. It mostly depends on the delivery method. We aim to dispatch all orders (including prescription orders with valid prescriptions) within 24 hours Monday to Friday – there isn’t a postal pick up on the weekends. The Royal Mail say First class post delivery times as being 1-3 days –it is usually 1 or 2, but their terms of service state up to 3 days. Courier items are next day services for orders placed before noon. So if you place a courier order at 11:30am on a Monday it will be delivered on a Tuesday. An order placed at 14:30 on a Monday will be dispatched Tuesday for a Wednesday delivery. We dispatch ‘standard courier’ orders on Fridays for Monday delivery. The exception is our specific Saturday delivery service. Discount codes are applied on the "Shopping Cart" page. Look under the Summary box to find the text "ADD DISCOUNT CODE". Press on the right hand "+" symbol and it will expand to reveal a text box. 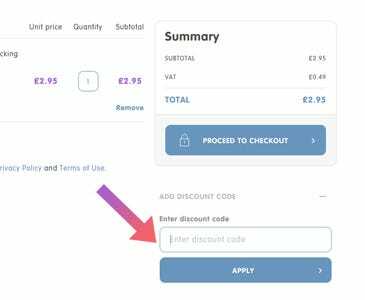 Type your discount code into the text box where it says “Enter discount code” and then press the "APPLY" button. The relevant discount will then be applied. You will see the discount listed in the Summary box above it. If there is a problem with the discount code then an error message will be shown at the top of the screen. Give us a call on 01761 603141 or email contact@petdrugsonline.co.uk and we’ll see what we can do to help. Obviously ‘tech problems’ can be wide ranging and so we may not be able to solve every problem on the spot. We promise we’ll be as straightforward as possible, but some technical issues (eg if Paypal is offline) are beyond our control. In such cases we’ll let you know what we know. For major problems (eg county-wide power outages) we’ll also have updates on our Facebook and Twitter accounts. Yes. Just put the address you want an order sent to in Delivery Address form at the start of the checkout process. You can have any number of different delivery addresses. The only real restriction is that we can only send prescription orders to same country as the one in which the prescription was written. You can have sent to any address in that country – it just has to be the same country. Don’t fret. Click on Sign In link at the top right of the site. This will cause the ‘Sign In” box to appear. Look below the Email box and above the Password box to find a Forgot Your Password link. Click this, fill in your email and we’ll start the password reset process. Now we’ll send you an email with all the necessary details, but please note that some email systems can view such emails as ‘dodgy’ (with the words “drugs”, “password” and a link in them – we can see why) as a result password reset emails can get automatically filed. So if the email doesn’t turn up, check your Junk, Spam or Clutter folders. And sorry to be a nag, but passwords are a vital component of data security, please make any password a strong one that mixes up capitals, lowercase, numbers and even special characters. And most certainly NOT one you’ve used elsewhere or Password1, which doesn’t count as secure. Can I change my order? I’ve noticed a mistake. Yes, but please be quick. Call us on 01761 603141 now! As we try to get orders on their way to you as soon as possible, there is a very limited window or opportunity before we hand it to the postman! If we can get to your order before it leave our hands we’ll happily help with a change of delivery address, change of product or change quantities – just be quick in letting us know. The same applies if you need to cancel an order, as it makes life easier for everyone if we can avoid the returns process. So if you need to cancel, act immediately - we won’t mind! How do I unsubscribe/cancel my account? Yes, If you wish to unsubscribe from our email newsletters then sign in and select My Contact Preferences from the My Account area. Here you will see a link that states UNSUBSCRIBE FROM EMAILS. Click it, re-state your email address and we’ll cross you off the list. To cancel your account please send an email to contact@petdrugsonline.co.uk that clearly states your desire to cancel your account and we’ll take the necessary actions. We use email addresses to identify customers as unique, so please be sure to send this email from the account associated with your Pet Drugs Online account. If you’re a phone customer and do not have an email address, then please call us on 01761 603141 to cancel your account. You can send us a new prescription by a number of ways. For the vast majority of prescription products we can accept either a copy or the original version. To send us a copy you can upload your prescription as part of the order process. This can be a photograph or scan – it just has to be legible. Alternatively you can send us a copy once you have placed your order via email contact@petdrugsonline.co.uk or fax 01225 430 234. Please send your prescription after you have placed an order (as we marry prescriptions to orders) and note your order number (eg 2121212121) in the email or on the fax as this makes matching the two together easier. And this means we can process the order quicker! You can also upload a scan or photo of a prescription via our Contact Us form. Select Prescription Query as the Subject and pop you order number in the Comment box. Again write the order number somewhere on the prescription. There are time limits on these prescriptions, so be sure to act quickly. For your own peace of mind you may also want to send the prescription in via a Signed for method, so you can check that it arrived. Sometimes your vet will prescribe a non-veterinary medicine for your pet (they’ll use the word “cascade”). We can sell these but only by telephone. The person who takes your order will be able to outline how you can send in the prescription for the products you have purchased. We use DPD as our courier. Do you have a returns service? Yes, you can return orders. There are however certain legal restrictions on the return of prescription products. For full details of our returns process and policy please see our Returns page. Can I return prescription medication? Our governing bodies the Royal College of Veterinary Surgeons and Veterinary Medicines Directorate prohibit us from accepting returns on prescription products. For full details please see our Returns page. Can I return non-prescription items? Yes. The items will need to be unused and in their original packing and if the error wasn’t at our end you’d have to cover the postage costs. For full details please see our Returns page. Will I receive a refund if I return something? If we made the error – eg sent the wrong item or it was damaged in transit – yes. If the item is simply unwanted then yes, but you’ll need to cover the costs of returning it to us. Please see our Returns page for details. Can I come and collect my order from you directly? Sadly no. We cannot offer a collection service. Can I drop off a prescription? If you happen to be local (hi, neighbour!) yes you can pop post through our letter box. You can find our address on the Contact Us page. Please note that we cannot offer an order collection service. If you have a complaint about a veterinary medicine that you do not feel that Pet Drugs Online has resolved satisfactorily or wish to report an adverse reaction to a veterinary medicine then please see our Prescription Information page for the necessary contact details for the Veterinary Medicines Directorate. Can I order prescription medication for someone else using my account? Yes but you will need to tell us you are doing so. Please be aware in such circumstances we will need to check and so may contact the prescribing vet or pet’s owner directly. What happens if the weather is too hot/cold to send refrigerated items? If a period of hot weather is forecast we’ll do our best to warn customers who purchase refrigerated products that we may be required to suspend dispatch of these products. If the predicted hot weather happens then we may be forced to suspend dispatch of refrigerated products. We will put information on our website indicating that we have suspended shipment and will send emails and SMS to any customers who have orders pending dispatch. We will still take orders, but hold all refrigerated orders until it is safe to send them. The same applies for really cold weather or if we get snowed in. Again! How do refrigerated items come packaged? Refrigerated items are packed (in silver foil bags in the summer which are then packed ) with frozen gel packs that will keep the product at the optimum temperature during the delivery process. What happens if refrigerated items arrive warm? If an item I order is out of stock will I be contacted? Our systems try to prevent to sale of out of stock products, but sometimes orders can get through for items not on our shelves. For the vast majority of these the item will available the next and dispatched with one day’s delay. For all longer term out of stock products we will contact you directly. Where we reasonably expect that the product will come back in stock in the near future we will offer you the choice of waiting or a refund. Where a product is long term out of stock we contact you and offer a refund. Is it normal for vets to charge for a prescription? Yes, vets must write a prescription for off-site fulfillment if you request one. They are allowed charge a reasonable fee for doing so. This normally translates to £8-12. To make sure you get your monies worth, ask if you can get a repeat prescription – which means you can use it multiple times. Do you give advice over the phone? No we cannot offer medical advice over the telephone or by email. Our customer care team can advise you on certain matters (eg flavours, formulations and how to calculate the number of worming tablets you need) but they cannot offer veterinary advice. Can I speak to your on-site vet? No. We have to be strict on this one. The RCVS require an animal to be under a vet’s care or to be presented to a vet in order for them to treat or advise on medical matters. We even asked about Skype-like services, but they are not permitted. Further to this we do not have on-site facilities for animal examination or treatment. Can I change information myself on my prescription instead of going back to my vets? You can change order details (such as delivery address) and the amount ordered but the prescription itself can only be amended by the prescribing veterinary surgeon. It is against the law to alter a veterinary prescription and any instances will be reported. Can a vet insist that I have to post you the original prescription? Yes. If the prescribing vet stipulates on the written prescription that the original must be presented, then we cannot accept scans, photos or fax versions. In such cases we, before we can dispense, we have to receive the original prescription by post. If your vet tells you that they are going to apply such a condition, be sure to ask for a “repeat” so that you get the maximum bang for your buck! How long does a prescription last for? Date wise, it varies. Most prescriptions are valid for 6 months from the date of issue. While certain classes of prescriptions are only valid for 28 days. See our Prescription Information page for full details. All prescriptions will specify a maximum amount of medication that can be purchased using it. When either expiry the date or maximum prescribed limit is reached then prescription is deemed to be ‘exhausted’ and cannot be used again.